Over the years, here at the ArtScroll office, we have learned a lot about Torah publishing. And a lot about people. One of the truths we’ve learned is that different people have different needs, backgrounds and abilities. As part of our mission of bringing the eternal words of Torah to the English-speaking public, we realize the importance of providing Torah classics in various formats and levels, so that every individual can achieve the most when learning. Thus, a quick glance at our catalog will show five different types of Siddurim, available in more than thirty different formats! That’s because we know that people have many needs – and we are determined to be there for everyone. The Schottenstein Edition of the Mishnah Elucidated and its inaugural volume, containing mesechtos Taanis, Megillah, Beitzah, Chagigah, Moed Katan, and Rosh Hashanah. The Schottenstein Edition of The Mishnah Elucidated will do for the Mishnah what the universally acclaimed Schottenstein Edition of the Talmud does for the Gemara. The new, elucidated Translation, based on the classic interpretation of Rabbeinu Ovadiah of Bertenoro (“the Rav”), adds words and phrases to make the Mishnah text read smoothly and clearly, without reference to the notes. This is ideal for those looking for a basic approach to the Mishnah – for example, people studying for a yahrtzeit or sheloshim and young people or adults who do not have extensive experience in Mishnah study. The Notes clarify the Mishnah further and draw, where necessary, on the Gemara or other classic Mishnah commentaries. Just as people can choose which ArtScroll siddur best meets their needs, so too, now there is a choice in Mishnah study. The widely acclaimed 44-volume Mishnah Series with the Yad Avraham commentary, dedicated by Mr. and Mrs. Louis Glick, in memory of their son Avraham Yosef a”h is an encyclopedic, in-depth commentary that presents many explanations, explores nuances and complexities, and cites a wide variety of works on the Mishnah, enabling students of Mishnah to delve more deeply and explore a wider range of comments. With the introduction of the Schottenstein Edition Elucidated Mishnayos and the recently completed Yad Avraham Mishnah Series, the Mishnah — the basis of Torah she’baal peh, the place where the Oral Law begins – is now accessible to everyone. 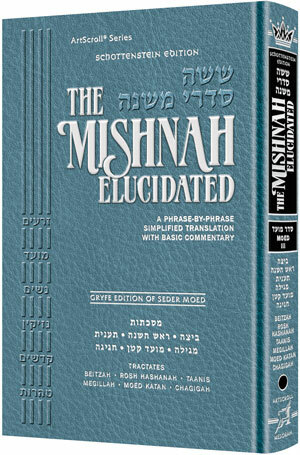 For concise Mishnah study, click here for exclusive online savings on the Schottenstein Edition of the Mishnah Elucidated. For in-depth Mishnah study, click here for the entire Yad Avraham Mishna Series.